Epilepsy is far and away the most common cause of seizures in dogs. While it is an inherited disease in some breeds, it can occur in dogs of all breeds, shapes, and sizes. Dogs with epilepsy typically experience their first seizure between one and six years of age. Epilepsy is a “rule-out diagnosis,” meaning there is no specific test to define that a dog has it. Rather, the diagnosis is made after ruling out other known causes of seizures. Diets that cause the body to produce an abundance of ketones (an acetone-like product made when fat is used as the primary energy source) have been used to treat epilepsy in people. Such ketogenic diets are very high in fat, low in carbohydrates, and are calorie restricted. Typically, the ratio of fat to combined carbohydrates and protein is 4:1 or 3:11. It is uncertain exactly how ketogenic diets provide benefit for some people with epilepsy. It is known that, in a state of starvation, ketones are the primary source of energy for the brain. An increased concentration of ketones on a regular basis appears to diminish seizure activity. Additionally, higher levels of omega-3 and omega-6 polyunsaturated fatty acids may subdue seizures by decreasing the excitability of nervous tissue and altering levels of brain chemicals called neurotransmitters1,2. Approximately two thirds of humans with epilepsy who consume a ketogenic diet experience a reduction in their seizures. These diets do have their drawbacks though. Not only are they highly restrictive, creating issues with patient compliance, they can be associated with adverse side effects. For these reasons, ketogenic diets tend to be recommended for people with severe epilepsy who fail to respond to traditional therapy. Phenobarbital, a drug commonly used to treat canine epilepsy, notoriously causes increased blood levels of a form of fat called triglycerides. Add to this equation a diet that consists of 80-90% fat, and one may be creating a recipe for disaster. Although not studied in dogs, the study suggests that the normal metabolism of anti-seizure medications (how long a drug dose lasts in the body after it is administered) may be altered in dogs who are significantly overweight or underweight. This can result in loss of seizure control because of medication levels in the bloodstream that are too low. Conversely, medication levels in the bloodstream that are too high can cause drug overdose symptoms. The authors of the study emphasized that maintenance of an ideal and stable body weight is important for dogs with epilepsy. This can be a challenging proposition given that increased appetite is one of the most common side effects for many anti-seizure medications. The rate at which anti-seizure medications are eliminated via the kidneys can be impacted by the pH of the urine. (The pH defines how acidic or alkaline a substance is.) One study documented that dogs whose urine was alkalinized (pH increased) experienced a more rapid elimination of phenobarbital compared to dogs with more acidic urine3. Dietary components influence the urine pH. Prescription diets used to prevent bladder stones and/or urine crystal formation in dogs do so by significantly altering the pH of the urine. Such diets should be used extremely cautiously in dogs receiving anti-seizure medications. The combination of treatments has the potential to cause loss of seizure control at one extreme and symptoms of drug toxicity at the other. Potassium bromide is a medication commonly used to treat canine epilepsy. The bromide component is interchangeable with naturally occurring chloride in the body. The key here is that the body maintains a constant sum of bromide and chloride. So, increasing one will cause a decrease in the other. For example, a sudden transition to a high-chloride diet would hasten the elimination of bromide from the body, resulting in lower levels of bromide in the blood stream and potential reduction in seizure control. Conversely, toxic levels of bromide in the bloodstream can occur if chloride intake is significantly reduced. Sodium chloride -- aka salt -- is the major source of dietary chloride. Consistency in what is fed, including treats, is of paramount importance for dogs receiving potassium bromide. In recent years there has been much interest in health benefits of the omega-3 fatty acids, docosahexaenoic acid (DHA) and eicosapentaenoic acid (EPA). DHA, in particular, has been found to play an important role in brain development. In epileptic rats, DHA and EPA have a protective effect on neurologic tissues, perhaps because of their anti-inflammatory properties4. It has been suggested, but not documented, that long-term administration of omega-3 fatty acids may have a similar effect on dogs with epilepsy. Additionally, these fatty acids are known to reduce high blood triglyceride levels, a common side effect of phenobarbital therapy. Taurine is an amino acid (a component of protein) that has been shown to have possible anti-seizure properties. A study using taurine in a limited number of epileptic cats documented improved seizure control. No such studies have been performed in dogs5. 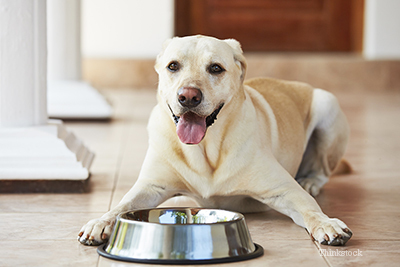 Talk with your veterinarian about the role diet may play in managing your dog’s seizures. Strongly consider dietary supplementation with omega-3 fatty acids for your epileptic dog (if your veterinarian agrees), particularly if phenobarbital is part of the therapy. If your dog is receiving anti-seizure medication(s), do not alter his or her diet before discussing the intended change with your veterinarian. Avoid high-salt treats if your dog receives potassium bromide for seizure control. Do not alter the dosage of your dog’s anti-seizure medication(s) without first consulting with your veterinarian. Do your best to help your dog maintain a healthy body weight. 1. Huffman, Jennifer, and Eric H. Kossoff. "State of the Ketogenic Diet(s) in Epilepsy." Current Neurology and Neuroscience Reports 6.4 (2006): 332-40. Www.matthewsfriends.org. Current Science Inc. Web. 2. Department of Nutritional Sciences, Faculty of Medicine, University of Toronto, Toronto, Canada. "Potential Role of Polyunsaturates in Seizure Protection Achieved with the Ketogenic Diet." National Center for Biotechnology Information. U.S. National Library of Medicine, Aug.-Sept. 2002. Web. 02 Oct. 2014. 3. Department of Pharmacology, School of Veterinary Medicine, Azabu University, Kanagawa, Japan. "Effects of Urine PH Modification on Pharmacokinetics of Phenobarbital in Healthy Dogs." National Center for Biotechnology Information. U.S. National Library of Medicine, 31 Oct. 2008. Web. 02 Oct. 2014. 4. Disciplina De Neurologia Experimental, Universidade Federal De São Paulo, Escola Paulista De Medicina, São Paulo, Brasil. "Neuroprotective Activity of Omega-3 Fatty Acids against Epilepsy-induced Hippocampal Damage: Quantification with Immunohistochemical for Calcium-binding Proteins." National Center for Biotechnology Information. U.S. National Library of Medicine, 13 July 2008. Web. 02 Oct. 2014. 5. K, Tanizawa, Mizuno T, Ueda K, and Koyama I. "Taurine Treatment for Spontaneous Epilepsy in the Cat." National Center for Biotechnology Information. U.S. National Library of Medicine, Oct. 1986. Web. 02 Oct. 2014.